You can configure SD Elements to include custom Project attributes that apply to all projects. Track organization-specific information or other meta information important to your project work. They can also be edited like other project attributes. Type: The text or Date. Label: A human-readable label that is displayed in the Project Edit form. Slug: A unique system-generated identifier. Message: An optional help/explanation message that is displayed in the Project Edit form. Mark this attribute as optional: This indicates whether or not this attribute is optional. The user has the system Super User permission. Fill the details for the attribute. 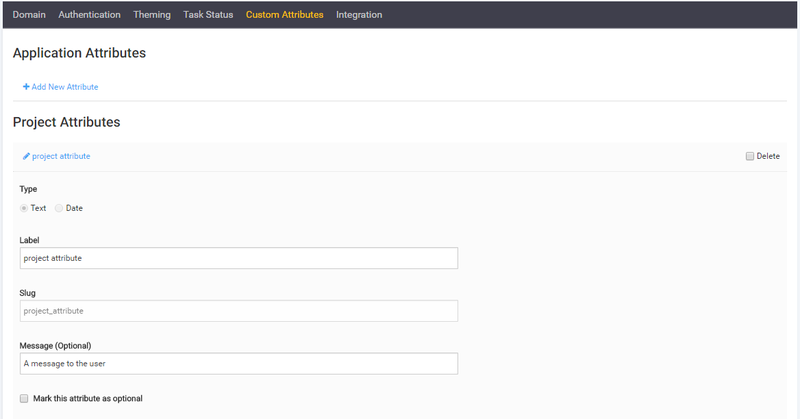 The new attribute is now available in all projects. Select the Delete checkbox beside each attribute you want to remove. This removes the attribute and its values from all projects in the system. Removing an attribute and its values is permanent. Click and drag the attributes in the list to match the required order. This updates the attribute list order for all projects.